I get a lot of questions from teachers who are new to teaching reading with an interactive read aloud. 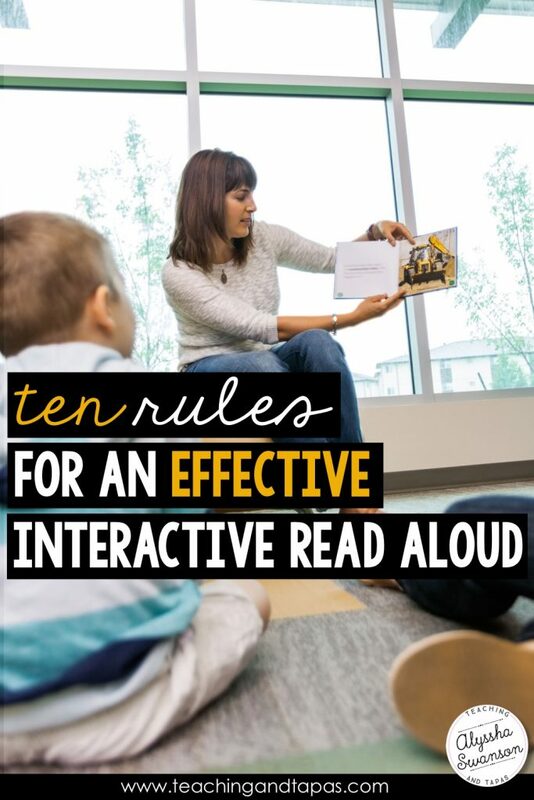 One of the main questions I get is, “What are the RULES of an interactive read aloud?”. The truth is that there is a LOT of flexibility with using an interactive read aloud to teach your lessons. However, there are some basics that are suggested starting points for making your most effective lessons. The phrase “interactive read aloud” refers to a read aloud that is a teaching lesson. A “read aloud” generally refers to reading a text aloud solely for enjoyment. BOTH have a place in an elementary classroom. I like to have a quiet and relaxing session of reading aloud from a long a chapter book for the last 15 minute of our day. This is very different from my interactive read aloud which is when I read a text aloud for a focused, specific lesson. Keep your interactive read aloud focused. For example, if you choose a text to read for a lesson focused on “character response”. Keep all of the commentary and interactive practice focused on that skill rather than mixing other skills into the lesson. Be deliberate when choosing the mentor texts that you use for your interactive read aloud. I suggest looking for books that give you a very clear opportunity to practice the skill you are teaching. Often early chapter books that are written at an early elementary reading level are NOT rich texts and do not provide meaningful opportunities to practice the skill. We have access to many great mentor texts in our school libraries, classroom libraries, or public libraries. You can find book lists organized by skill online OR you can just flip through the books you love. If you are looking for a certain skill, you will be able to find it. I usually spend about 10 minutes a week looking through my books with my upcoming reading strategies in mind. Our classrooms are too full for us to rely on calling on one student at a time. Every student needs to be thinking and interacting for every question you ask. For some more detailed tips on how to make your lessons more interactive, you can see my related blog post here. Your goal will be to model how you use the skill in your own reading during your mini-lesson. The more authentic your modeling is, the more effective your lesson will be. To do this, sit down with the book before you teach the skill. Read it with the strategy in mind. For example, if you are going to do a lesson on “context clues”, read the book and notice when you use the skill yourself. Write this down on a sticky note and put it on that page of the book as a reminder for when you read the text aloud to the class. A concise lesson that does not drag on for too long is the best for keeping all students engaged throughout. It is totally okay to read part of a book for your lesson. If needed, you can use just a small section of text to illustrate and practice the strategy. Ideally, you should stop 3-5 times during your read aloud and model how you used the strategy. Don’t stop too often or you will stifle the story so much that it is hard to follow. Include the interactive elements such as “turn and talk” within this 3-5 stop range. Remember, the purpose of the interactive read aloud is the lesson, not the story. When you read a familiar story with a new focus, your students may see it with fresh eyes. The great thing about using an interactive read aloud as a main part of your reading lesson is that it is SO easy to create an effective lesson…and you can do it as many times as needed. If you are noticing your students struggling with a specific skill, use your interactive read aloud time to model the desired behavior as many times as you need to.